About // Pat Godwin // Singer. Songwriter. Comedian. Pat Godwin has blossomed into one of the most clever comedians and prolific, award-winning comedy songwriters in the business. Pat first got national airplay with the holiday classic he crafted with his brothers James and Jack called, “Let’s Put Christ Back in Christmas” from the album Reindeer Games. After that, it wasn’t long before Godwin’s talents were being used on radio morning shows; a medium Pat is more than familiar with. He’s appeared on every top morning show you can think of, worked for 6 years as a part of Philadelphia’s Morning Zoo, 3 years for The Bob & Tom Show, and was a frequent guest and contributor to both Howard Stern’s radio and TV shows. It comes as no surprise that Godwin is enjoying some success, seeing as how he possesses one of the most entertaining and original live shows in the business. He was featured on NBC’s Last Comic Standing in 2009. Because he has such strong material and highly developed improvisational skills, no two shows are ever the same… not even close. And don’t let that sly boyish smile fool you; it only takes about three seconds on stage to realize that Pat’s comedy has an edge to it. With a mix of quirky, personal musings and off-the-cuff remarks, Godwin can segue in to any one of his songs, performed in an endless array of musical styles. He recently headlined The Irish Comedy Tour employing his vast catalog of Irish material and original drinking songs like, “Switch To Beer” and “Maybe It’s Time To Go Home”. 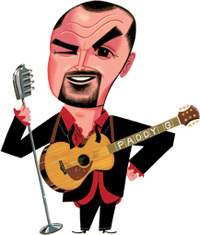 Though Pat’s been charming audiences in clubs for years and has been featured on every major radio morning show in the country, one of his greatest achievements came with the release of 2005’s “Under the Bed“. Godwin wrote and recorded an eclectic compilation of new tunes, and live favorites, as well as exorcising some of the demons left behind from a relationship gone wrong. But don’t let that dark description scare you; “Under the Bed” is hilarious, and getting heavy rotation on the nationally syndicated Bob and Tom Show. It contains the Number 1 most requested song on morning radio, “Gangsta Folk,” as well as the International Songwriting Competition award winning songs, “C’est La Vie” and “First Date”. The CD “Captured Live” was released to rave reviews in 2011. Age: What am I, a car? volbrechtguitars.com – Maker of Pat’s one-of-a-kind guitar. bobandtom.com – Nationally syndicated morning radio show. alanjohnsonrecording.com – The studio where Pat does all his recording. adrenalinemotionpictures.com – Creators of Pat’s upcoming documentary film. theirishcomedytour.com – They’re Irish, they’re American, and they’re not holding back. mygodwins.com – Trace the Godwin family genealogy. humanradiator.com – The amazing designer behind Pat’s marketing materials. 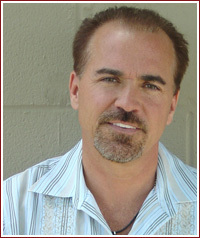 sincitycomedy.com – Comedy club in Las Vegas that is one of Pat’s favorite tour stops. Spilled coffee on Rolling Stones’ guitarist Keith Richards white shirt right before he went on stage at The Tower Theater in Philadelphia, PA. Keith wasn’t mad, but amused. He put his arm around Pat and proceeded to warm up before the show by singing horribly off-key and drinking copious amounts of a beverage Mr. Richards called “Nuclear Nightmare”. He looked down at his coffee stained shirt and remarked, “Looks like puke... It’ll be good for my image”. Hates Don McClean. Don pissed Pat off in his hometown of Wilkes Barre, PA where he was opening for the singer/songwriter/douchebag. Pat went onstage and regaled the crowd with Don’s boring backstage behavior and then sang a very unflattering version of Don’s only hit, “American Pie”. Performed “The Aaron Neville Song” on The Howard Stern Show live from Cleveland, OH. Has appeared on 6 Bob & Tom CDs, 3 times on 2 albums... a comedian record. Followed Crosby, Stills, and Nash performing “Suite Judy Blue Eyes” at The Spectrum in Philadelphia, PA in front of 22,000 people for WMMR’s 20th birthday party. It’s hard to do well after the acoustic super-group sings, “Do do do do do, do do do do do do” and gets a standing ovation lasting 10 minutes. Wrote a song called, “Sing Potato, Sing!” in reference to a snarky comment from Randy Newman about Brian Wilson in a Rolling Stone Magazine article. Randy heard it, loved it and came on WMMR’s Morning Zoo in Philadelphia, PA to perform it with him. Met Eric Clapton at Sigma Studios, when the guitar icon was hitting on his girlfriend at the time. Clapton realized his mistake, and ended up hanging out with Pat and listening to a rough mix of “Elvis Is Coming Back For Christmas” off his Reindeer Games CD. Eric signed Pat’s Guild acoustic guitar (something he rarely does) and he gave that guitar to his friend, Tom Griswold (co-host of The Bob & Tom Show) for producing his album, “Under The Bed”. It hangs in Tom’s office. Played Pinball Wizard with Pete Townsend of The Who on WMMR’s Morning Zoo, while broadcasting from London. Pete signed Pat’s Takamine guitar. It hangs in his office. Was the original home shopping show host for a company called, “Video Mall” before QVC started. Held his high school pole vault record for over 20 years. Did the voices for Inspector Gadget and Batman for The Kartoon Krew. It went to #5 on Billboard in the 80’s. Bristles when people call his original songs, “song parodies”, and despises the term “Guitar Act”.